In the past several years, analysts and policymakers have expressed concerns about the aging of America’s light-duty car and truck fleet. The U.S. Bureau of Transportation Statistics found the average vehicle age was 11.6 years in 2016, up from 10.9 in 2011. A CNBC report from 2015 noted that nearly one out of every four vehicles in the U.S. had been built before the year 2000. More recently, an analysis from the U.S. Energy Information Administration (EIA) showed that average vehicle age was increasing across all vehicle types and household income levels. 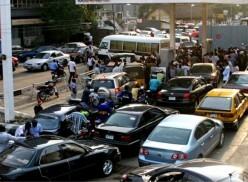 While some see this as a sign of increasing vehicle reliability, others remain troubled. The aging of household vehicles was cited as a key motivation for the proposal from the Environmental Protection Agency (EPA) and the National Highway Traffic Safety Administration (NHTSA) to freeze fuel efficiency standards at 2020 levels through MY2026. The below figure demonstrates that, over the last decade, American households increasingly held on to older cars. In particular, the administration’s proposed fuel efficiency rule expressed concern that stringent fuel economy standards have raised the price of new vehicles and made them less affordable. The agencies believe that “the average age of the in-service fleet has been increasing” due to this rise in vehicle prices and that this leads to “market-wide incentive to extract additional travel from used vehicles.” Put simply, they believe that older vehicles are incurring an increased number of miles traveled per year. This would be problematic because older vehicles are generally less safe and less fuel efficient than newer cars. The agencies argued that easing up on fuel economy standards will drive down vehicle prices and enable more Americans to take advantage of the safety and fuel economy benefits of newer cars. The safety and environmental impacts of older vehicles are dependent on the mix of vehicles in active use on roads, which depends on how often older vehicles are driven, not solely on how many of these vehicles exist. However, almost every analysis of vehicle age does not consider the level of usage. If you have a brand-new car which you drive all the time and a 12-year-old car you keep around for occasional use, you effectively drive a new car, but you will show up in statistics as owning cars with an average age of six years. Using new data, SAFE performed additional analysis on vehicle age and found that it is not as clear cut that vehicles – when we account for how much they are used and the increase in vehicle ownership levels – are getting older. The safety and environmental impacts of older vehicles are dependent on the mix of vehicles in active use on roads, which depends on how often older vehicles are driven, not solely on how many of these vehicles exist. An updated estimate of the age of U.S. vehicles has implications for safety research and future regulatory proceedings. Last year, the U.S. Department of Transport (DOT) released the 2017 National Household Travel Survey (NHTS), covering household travel from late 2016 into early 2017. 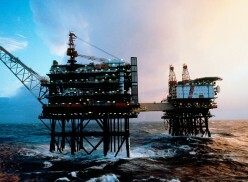 The previous survey occurred in 2009. 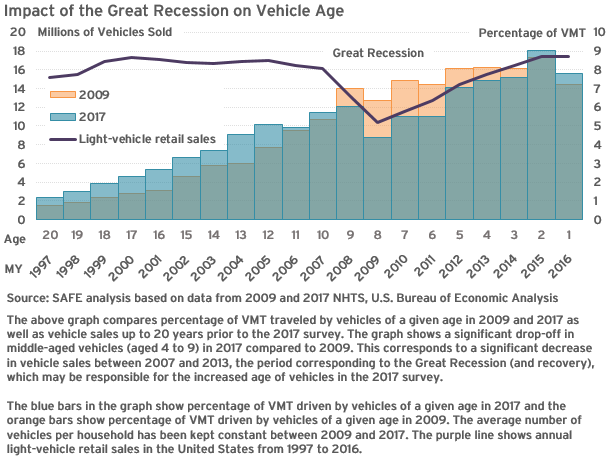 This allows us to take a detailed look at the age of vehicles that American households use and its evolution between 2009 and 2017. 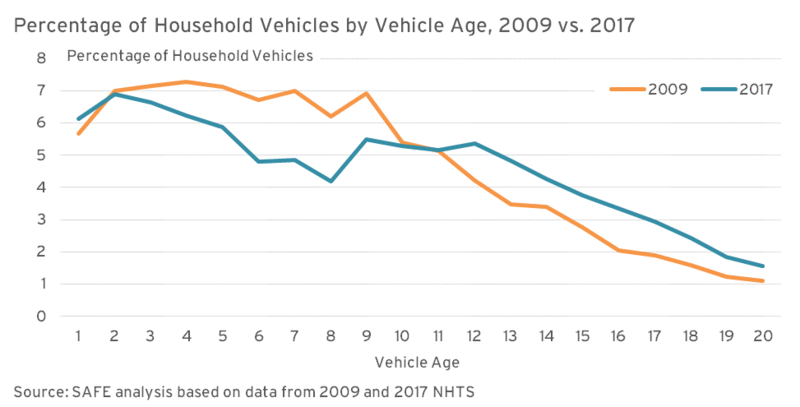 First, we calculated the average age of household-owned vehicles without accounting for their level of use and found that average vehicle age rises from 9.4 years in 2009, to 10.4 years in 2017. These values are similar to those obtained by the EIA and consistent with the narrative that Americans are holding on to vehicles for longer. Only accounting for how many vehicles of a given age there are in a fleet does not truly capture the effects on safety and the environment. However, as noted above, only accounting for how many vehicles of a given age there are in a fleet does not truly capture the effects on safety and the environment. To do so, we must examine the age of vehicles on the road weighted by the amount of travel. When looking at travel-weighted age, average vehicle age in 2017 falls to 8.9 from the unadjusted 10.4-year calculation. This suggests that newer vehicles in 2017 travel far more than older vehicles. This is reflected in average VMT calculations for vehicles of varying ages in 2017. 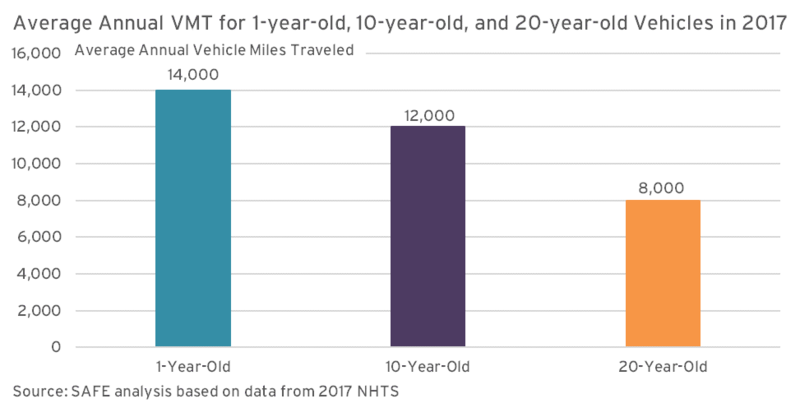 Average annual VMT falls from approximately 14,000 miles for 1-year-old vehicles to approximately 8,000 miles for 20-year-old vehicles. A large part of the reason that there are more older cars is that households are keeping their existing cars even as they purchase newer cars. The total number of cars owned by U.S. households increased 5.2 percent from 2009 to 2017. 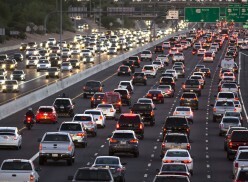 This happened for two reasons – the U.S. population grew, and the average number of cars per household went up. To account for the growth in household vehicles, we limited the 2017 sample to approximately the 198 million youngest vehicles to match the number of vehicles from the 2009 sample for which we have travel estimates. This would represent the age of the U.S. car fleet if every time a new car was purchased, the oldest car in the fleet was scrapped. When we analyzed this subset, we found that average vehicle age was the same across both years (7.9). This suggests that cars on the road are not getting older – we’re just keeping the older ones around as we buy new ones. If we accounted for the growth in the number of households, but controlled for the increase in vehicle ownership rates, then there would only be 209 million household-owned vehicles on the road in 2017 (as opposed to 223 million). If the vehicle ownership rate had stayed constant, there would be a one-half year rise in the ages of cars on the road in 2009 (7.9) and 2017 (8.4). While we’ve made the case that household vehicles are not as old as commonly believed, some aging has occurred. A significant reason for this aging was the non-replacement of vehicles during the Great Recession. New light-duty vehicle retail sales remained at least 10 percent below 2007 levels from 2008 to 2013. This significant drop-off in sales is the reason for the decline in middle-aged cars in the 2017 survey (clearly visible in the graph below). Car sales have rebounded since the recession, and there are more newer cars on the road than there were in 2009. However, there are “missing” 4- to 9-year-old cars that were not replaced during the depth of the Great Recession auto sales crash; those years contribute most of the additional age in the 2017 fleet. Claims of a sharp rise in vehicle age over the last decade do not account for usage patterns that reduce the negative impact of older vehicles with lower utilization. Some aging of the vehicle fleet occurred over the last decade, but it was largely driven by new vehicle additions that did not displace old vehicles, which are not immediately scrapped and continue to remain in the fleet in spite of being driven less. The normal displacement of older cars by newer cars was slowed during the Great Recession; this contributed to a larger number of older cars in use in 2017. As sales rebound to pre-recession levels, the average age of U.S. vehicles is likely to decline.